As part of the Library's DigiLit Community: Let's Get Digital program, seniors in the University Area were able to gain skills to build digital literacy without leaving the comfort of their community. 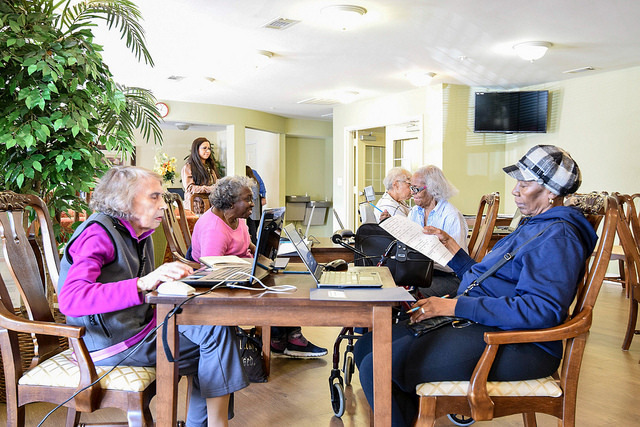 Throughout the 6 classes offered in this program, seniors have access to hands-on learning in the areas of computer basics, web basics, Microsoft Word and Excel basics, mobile devices and library digital resources, and social media. Not only will participants attend a graduation ceremony to celebrate their achievements, but they will also be more proficient in using a computer in their everyday life. While the Library offers numerous programs to help with digital literacy, this program is unique. DigiLit Community takes the curriculum, staff and devices into the community to reach those who may face barriers in accessing a traditional library facility and program. Thanks to a new gift from the Van Every Foundation to support two portable computer labs, DigiLit will be in the community even more. It also offers a structured sequential curriculum (as opposed to a one-time class) and individualized practice time to make the sessions relevant to the student's needs. DigiLit Community helps advance the Library's overall mission to improve lives and build a stronger community.